Standard Chartered is putting aside $900m (£690m) for potential fines involving investigations in Britain and the US. The money will cover separate investigations into breaches of US sanctions and foreign exchange trading issues. It also covers a £102.2m fine from the UK's Financial Conduct Authority related to financial crime controls. The provision will be included in the bank's results due next week. The bank, which is listed in London and Hong Kong, warned last year that continuing investigations by the US and UK regulators could have a "substantial financial impact". 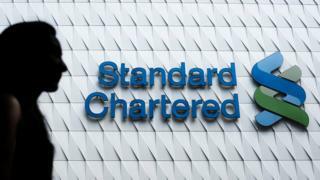 "Standard Chartered's 2018 fourth quarter results will include a provision totalling USD900 million for potential penalties relating to the... US investigation and FCA decision, and for previously disclosed investigations relating to FX trading issues," the bank said in a filing to the Hong Kong Stock Exchange. The Financial Times reported in October that the bank could face a $1.5bn fine from US regulators for alleged sanction breaches involving Iran-based clients of its Dubai branch. Standard Chartered shares listed in Hong Kong fell more than 1% earlier, according to Reuters.